While the picture above depicts Jesus just as I would have imagined him less than three years ago, lovingly teaching his followers, the truth is we know very little about the historical Jesus. In fact, the Wikipedia link in the caption above will take you to a page dedicated to the "Quest for the historical Jesus," as scholars endlessly work to determine what we can truthfully know about the man worshiped by nearly a third of Earth's population. Ironical, right? I guess divine hiddenness really is a thing after all. Natasha Crain, author of Keeping Your Kids on God's Side, spends the next eight chapters discussing Jesus, so let's tackle Chapter 17, "How do we know Jesus existed?" The fact that this question has to even be addressed does not bode well for Christians. "[Mythicists] are not influential among scholars of antiquity, historians of the ancient world, classicists, and biblical scholars. There, they’ve made virtually no impact. Where they have made an impact is in popular circles, especially with the advent of the Internet. There is an increasing following of these people on the Internet, and a number of them have written books that have sold a lot of copies." While I admire Dr. Ehrman's massive contribution to both New Testament studies and my eventual deconversion, the two most prominent mythicists, Dr. Robert M. Price, with a Ph.D. in Systematic Theology and New Testament, and Dr. Richard Carrier, a Ph.D. in Ancient history from Columbia University, both offer extremely compelling arguments against the historicity of Jesus. Their knowledge on the subject is both profound and expansive and should by no means be disregarded, despite the fact that most of us are programmed to think that, of course, Jesus existed. Natasha's concerns regarding this increasingly popular theory are not unfounded. She then moves into the most prominent secular sources that mention Jesus and notes that while these "non-Christian sources may not seem like much historical evidence, it's important to keep in mind that there are very few documents of any kind that survive from Jesus' day." The secular sources are indeed slim pickings and offer very little biographical information on Jesus that was not already circulating within the Christian movement. 1) She first mentions Flavius Josephus (AD 37-c. 100), a Jewish historian. The first passage Natasha provides shows later alterations by Christian scribes, as it's unlikely that a Jewish historian would concede that Jesus "was the Christ," as highlighted below. This makes it a flawed resource at best. "Now there was about this time, Jesus, a wise man, if it be lawful to call him a man, for he was a doer of wonderful works, a teacher of such men as received the truth with pleasure. He drew over to him both many of the Jews, and many of the Gentiles. 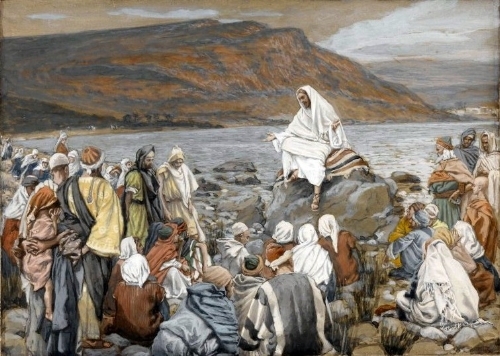 He was the Christ, and when Pilate, at the suggestion of the principle men among us, had condemned him to the cross, those that loved him at the first did not forsake him; for he appeared to them alive again the third day; as the divine prophets had foretold these and ten thousand other wonderful things concerning him. And the tribe of Christians so named from him are not extinct at this day." "So he assembled the Sanhedrin of judges and brought before them the brother of Jesus, who was called Christ, whose name was James." While this passage is less controversial and scholars generally agree on its authenticity, there is some debate that the passage is actually referring to Jesus son of Damneus who had a brother named James ben Damneus. Furthermore, it is unknown whether Josephus is offering independent information or relying on the Christian testimony of his day, which would certainly take away from the "secular" aspect. "Hence to suppress the rumor, he falsely charged with the guilt, and punished Christians, who were hated for their enormities. Christus, the founder of the name, was put to death by Pontius Pilate, procurator of Judea in the reign of Tiberius: but the pernicious superstition, repressed for a time broke out again, not only through Judea, where the mischief originated, but through the city of Rome also, where all things hideous and shameful from every part of the world find their center and become popular." Here, Jesus is mentioned in relation to Christianity as a religious movement vs. providing biographical information. As Natasha admits regarding Tacitus, we once again have no source of reference material concerning this passage. 3) Next, Pliny the Younger (AD 61-c. 112) also mentions that Christians worship a Christ figure. As in the case with Tacitus, we're given little evidence of the historical Jesus. "Thallus, in the third book of his histories, explains away this darkness as an eclipse of the sun—unreasonably, as it seems to me (unreasonably, of course, because a solar eclipse could not take place at the time of the full moon, and it was at the season of the Paschal full moon that Christ died)." So, not only do we not have any direct quotes of Thallus, Thallus himself makes no mention of Jesus. Maybe the most important thing to note here is the dating of these sources--not one of these is offering us any contemporary historical evidence for Jesus! If you've got a man who is raising the dead, healing the sick, and exorcising demons left and right, who is later crucified, rises from the dead, appears to many, and then ascends into the heavens in front of crowds of people, why would no contemporary sources write about it? That's a problem. This doesn't mean that Jesus did not exist. It just means no one was taking notice. Next, Natasha moves into the evidence from Christian sources -- firstly, the New Testament. She notes, "You don't have to accept any theological claims of the New Testament to acknowledge that these books support the existence of a historical Jesus." While I agree with her statement, it's important to recognize two major problems regarding the New Testament which affect our ability to glean accurate historical facts regarding Jesus. 1) Scholars doubt that the anonymous Gospel writers are actual eyewitnesses to the life of Jesus. The earliest book, Mark, was written approximately four decades after the death of Jesus. Furthermore, they are not considered historical works, as their material is overwhelmed by unverifiable miracle claims. Moreover, Matthew and Luke are dependent on Mark for much of their material vs. offering independent information on the life of Jesus. 2) Paul, the author of at least seven epistles in the New Testament, was also not an eyewitness to the ministry of Jesus and provides sparse details regarding his life. Lastly, we have the writings of the Early Church Fathers, second century writers that "presumably had first-hand knowledge independent of the New Testament sources." While I won't go into great detail here, Natasha mentions Clement of Rome, Ignatius of Antioch, and Polycarp of Smyrna. First of all, these are obviously biased sources, as they are devout members of the Christian movement. Secondly, I have no reason to believe that they were not utilizing the New Testament as their own source material, given the later dates of their writings. I know this was a lengthy post, so thank you for sticking with me to the end! The bottom line is this. Few people doubt that an apocolyptic preacher named Jesus existed, but this is obviously not what Christian apologists are claiming. They are claiming the deity of Jesus Christ. Given the very scant information that can be extracted from the sources listed above regarding a historical Jesus, why should one take the leap of faith into the realm of deification? The skeptic in me would have to leave all critical thinking skills at the door, and that's not something I'm willing to do anymore. **For more detailed information on the evidence for a historical Jesus, I strongly recommend reading Matthew Ferguson's excellent article, "Ten Reason to Reject the Apologetic 10/42 Source Slogan."